Despite my hopes, there were no Bea Arthur photos gracing the entry way. Eric and I arrived at Cafe Maude at the exact same time (a rarity.) Seeing him walk towards me, squared off shoulders, familiar, but matured smile, made my shoulders and nose scrunch up. It'd been too long. Where we used to dine together. Not too long ago, Eric was my number one dinner companion. Funny how married life changes things. I hugged him tightly and we walked inside. The noise level was bustling and every table was packed. We were early for our reservation and there weren't any tables open. Luckily, there were a couple of spots at the bar. 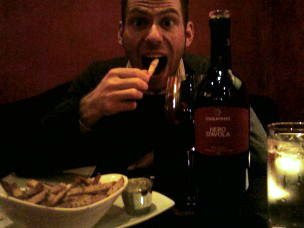 We sat down and ordered a bottle of wine and the fries. Everyone that had even glimpsed Maude's menu had suggested the fries. Moments after we sipped our slightly heavy (but in a woolly blanket kind of way) wine a booth in the back of the restaurant by a large table of women celebrating a birthday. I'd been sitting on my purse with my phone set to vibrate when Laura called. It was an unnerving sensation. She said she'd just finished up drinks with a friend and wanted to know if we'd mind if she joined us. Firmly believing in not only, is more better, but another mouth meant we could order more food, I told her to move it down to 54th and Penn. The fries arrived while we were waiting for her. They were delicious, house sliced potatoes dusted with sea salt and what seemed like fried parsley accompanied by a little dish of melted cheese. We dug in. "Oh...?" Eric said. They had a kind of unexpected flavor. We mulled it over- "It's white truffle oil!" I proclaimed. "Really," he frowned at his fry. "You know they say most truffle oil isn't the real thing - it's artificially flavored. You can't get real truffles in olive oil for only $10." I raise my eyebrows at him. "Okay, maybe you get the real stuff, but mine at home doesn't taste like this. Pierre has banished it from the kitchen." The real stuff, thank you very much, is a pronounced, distinctive flavor that was now slowly rolling over my palate. Besides, I only spend my money on ridiculously high quality and mostly unnecessary food products. The fries were excellent and at $5 a great little start to the meal. They were also a distant memory by the time Laura arrived looking more gorgeous than anybody has a right to at 8 o'clock on a Tuesday night. The entire time we caught up and mulled over the menu, our waiter was near at hand, but never intrusive. My wine glass was never empty and I knew that once we did finally decide on what to eat, he'd be right there, ready. We couldn't decide on whether to order lots of small plates, or our own entrees. "I want the beet salad." Eric's always been partial to beets. "I don't care what you guys want. I'm having the beet salad and the lamb skewers." That decided it - we went for a few small plates to share. We ordered, sipped and chatted. At the moment I couldn't be bothered though, because I was slicing into my first croquette. The crusty, brown outer shell gently gave way to the creamy risotto and the gooey little bit of cheese tucked into the center. The mouth combination was exquisite. Gooey, creamy and crispy, with just a little how-do-ya-do from the red bell pepper, just a little added veggie sweetness. "Ohmygodyouguysthisissogoood!" I shoved the other half into my mouth for another texture explosion. I imagined that if I was lucky enough to have grown up Italian that I would so totally have been made this by my loving mother from the previous nights leftovers. "Manga! manga!" 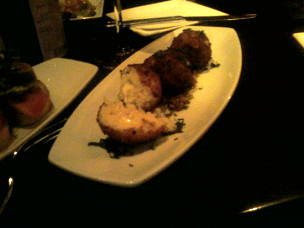 Eric was happily nodding at his lamb skewers that were ground, spiced lamb meat. He offered me a bite with a bit of the coleslaw accompaniment. It was spicier than I expected, but in a really good way. There was a little bit of heat, corriander and it was all cooled off by the sweet, crispy, creamy cabbage. The yogurt in the dressing gave it just a bit of a tang, but it was the perfect cool compliment to the racy little lamb skewers. I gaped at our plates trying to determine what to approach next. What would be my favorite? I stabbed a bit of Eric's gorgeous beet salad. It perfectly dressed. The golden beets radiated from the salad plate like the promise of spring. They were expertly prepared tender crisp and lovely. The goat cheese that dotted the salad was also wonderful. Still, for my money, I'm going for real cheese. I stabbed at the penne, around Laura's arm - she'd clearly picked her favorite. And soon it was all over. 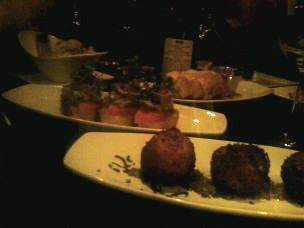 Croquette, Ahi, Ahi, mac and cheese, croquette, croquette gone! There was a collective sigh of disappointments (can't we just keep eating) and satisfaction, (I want to live here.) Bit by bit, our empty plates were taken away until all that remained was the dessert menu. I'm not usually much of a dessert eater, but my companions are. Eric claims to have an entire dessert compartment. They ordered the Chocolate Pistachio Torte. Oh, why don't I eat dessert more often? 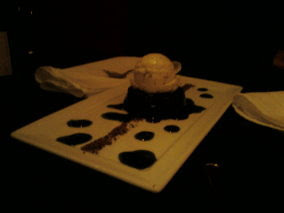 It was a beautiful dessert, pictured here, but prettier in person. It was artfully dolloped with creme de menthe. The ice cream, chocolate and crunchy little nuts came together and sang the taste buds home. The chocolate was dense and supple, the nuts were slightly toasty, but still had that distinctive pistachio meatiness to them, the light minty, syrup flavor cut through the whole thing that otherwise, would have been awfully sweet and rich. It was decadent, wonderful, captivating, delightful and full. Just like us. Am dreaming of those ahi toasts. The flavor combo was remarkable. They're certainly in the running with the ahi springrolls at Zelo, my all-time favorite food. We had some top notch yum-yums at Azia last night, including wonderful smokey grilled steak skewers that weren't dried out and retained some nice pink in the middle (a feat to be sure). So flavorful and reminiscent of summertime.